My mom had a tradition when my brother and I were growing up. She took us to the dentist twice a year every year even though she didn’t have a lot of money to pay for those visits. And after each of those dentist visits, she would take us to Braum’s for a scoop of ice cream. She even took us after the occasional follow-up visits for fillings. That was fun. Trying to eat ice cream with half your face numb. This might seem like an exceptionally illogical, bad parenting move. Taking your kids for a sweet treat after getting their teeth cleaned or repaired. Just inviting more trouble in the future. We loved her for it. I think I might have inherited whatever gene caused my mom to engage in this activity. Today, I worked with the kids on cleaning their rooms and other parts of the house. And then we went outside and cleaned out the car. Our car is one of the most junked-out vehicles on the road. Or at least, it seems that way to me. The floorboard in the backseat is usually not visible. Once we dug out all the toys and trash and clothes and books and… a seriously desiccated pomegranate, we were left with a floorboard covered with grass and dirt and bits of trash too small to pick up. I decided we needed to give the poor car a serious cleaning. The kids were extremely well behaved while we waited at the car wash. When our car went out to the area where they vacuum and clean the inside, I saw the guy open the car, then walk away and ask one of his buddies to come help him out. The car belonging to the lady who came in considerably later than us was ready quite awhile before ours. Eventually, though, the car was ready. It looked great! I thought the kids deserved a reward for working so hard and being on their best behavior. So I took a play from my mom’s playbook: I took them for ice cream. But the pizza was ready to be picked up too, so we didn’t eat it there. Yes, that’s right. 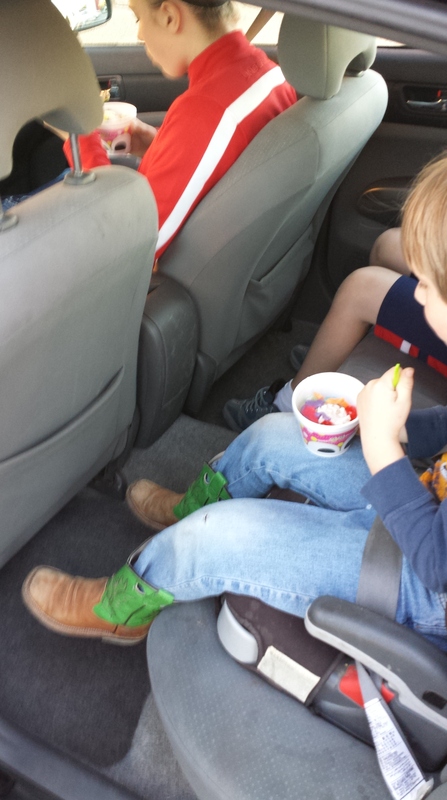 I allowed three children to eat ice cream in the freshly cleaned car. Because I’m just that kind of special.